The Almighty Latin King & Queen Nation (ALKQN) has become one of the biggest street gangs in the United States with chapters in multiple cities and towns across several states including my hometown of Brooklyn, New York. It was founded in the city of Chicago and has an estimated 50,000 members and counting. Showing no signs of slowing, the gang continues to recruit young men and women who are seduced by a life of power, money and acceptance. The attraction of the street life proves irresistible to many and masks the dark side of life on the streets. There is an old saying that there is no honor among thieves. And to live like an angel when you are surrounded by demons is not an option. The life of a gangster is a mix of excitement, incarceration, violence and death. Supplementing these are the lures of fast money and fast women. This is the life that Sonia Rodriguez, known on the streets of Chicago as Lady Q, exemplified for the majority of her life. Her story is presented to us by author Reymundo Sanchez who is the author of several books on the Latin Kings, and former gang member himself. The story of the female gangster is rarely heard of and in most cases overshadowed by the male counterpart. Sonia’s story showcases what it truly means to be a Latin Queen. Like many of the members of the ALKQN, she is of Puerto Rican ancestry and has lived on the island at different points in her life. Her home was occupied by several stepfathers and a dysfunctional mother stuck in her own abusive relationship cycle. The toxic elements set the stage for Sonia’s descent into the streets where she meets members of the ALKQN and embraces the gang life that nearly destroyed everything she believed in. If you ask most gang members why they joined, a large number will say they feel as if they belong to something and feel accepted. The broken home has always been considered a source of social dysfunction and resentment in the men and women that choose the streets over a life at home. Her story could be that of any number of young women. The horrors of sexual and emotional combine with the birth of her daughter to play an integral part in her development into a young woman who struggles to break the cycles in which her mother has fallen victim. On the streets, she rises to become the top member of her chapter and even makes an appearance on the Oprah Winfrey show and in the process becomes a high value target. Nonetheless, she perseveres throughout each crisis and is alive today to talk about it. But tragically, the time she spent on the streets and her lack of a formal education have made a normal life seemingly impossible and even after her status as Lady Q, chaos and uncertainty continue to dominate her life. Her trials and tribulations are examples for other young women attracted to the false promises of the gang life. The truth is brutal and repulsive at times, but necessary in preventing others from making her mistakes. With this book, Sonia has joined a long list of men and women who have put their gang life behind them and face daily changes to live a straight life. The lure of the street is always present and the past has a way of coming back to haunt us when we least expect it. For Sonia, time will tell where her life will go. We hope that she does not revert back to her gangster lifestyle but she is the only one who can control that decision. 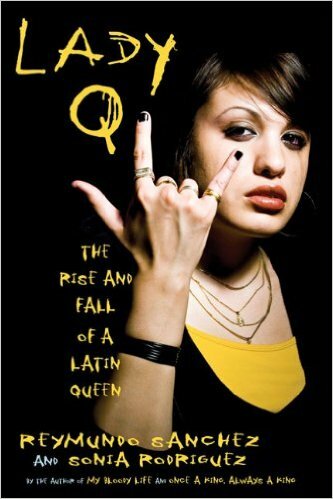 For a fascinating read about the female experience in the Latin King & Queens organization, this is a good place to start. Posted on September 9, 2015, in Biographies and tagged ALQKN, Organized Crime. Bookmark the permalink. Leave a comment.